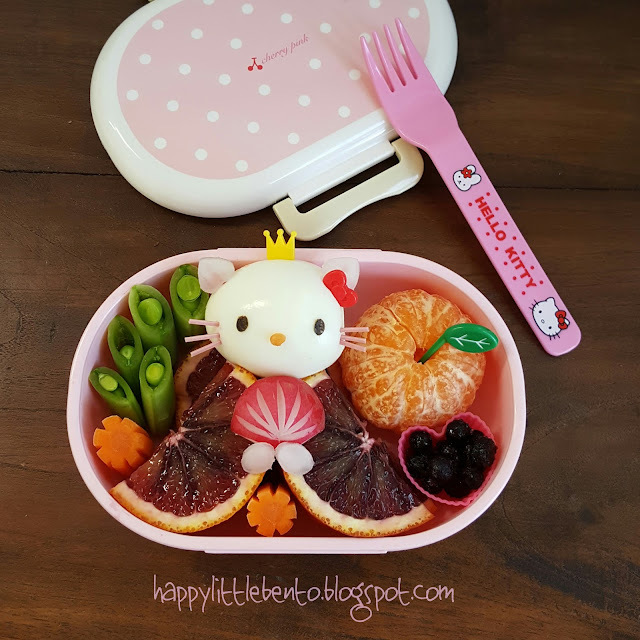 Happy Little Bento: Happy Girls' Day Bento! In Japan, Girls' Day (Hinamatsuri, 雛祭り) is celebrated on March 3. On this day we wish for the health, success, and happiness of girls. My TinySprite is 10 years old, but not too old to enjoy a sweet token of my love for her. I hope she likes her Hello Kitty bento treat. Happy Girls' Day! In this bento: hard boiled egg, radish, carrot, blood orange, snap peas, wild blueberries, mandarin orange. so cute! happy girl's day you two! I am sherimiya ♥, and these are my kids MisterMan & TinySprite. Glad to meet you, and thanks for visiting us. We ♥ bento, and hope you enjoy our bento adventures here! Find me on the web & in the news! The New Yorker, "Bento Boxes and the Grade-School Power Lunch"
New York Times, "Bento Boxes Win Lunch Fans"
Miami Herald, "Let's Go Bento!" Whole Foods Market, "Bento Box Lunch Ideas: 6 Easy (and Insta-worthy!) Options"
PBS.org, PBS Parents, "Bento Lunches For Kids"
CNN.com, "Sink Your Teeth into Creepy, Gory Halloween Eats"
The Huffington Post, Kitchen Daily, "Bento Box Lunches For Kids"
Glamour, "Healthy Eating: Bento Boxes are the Hot New Lunch Boxes"
KoreAm Journal, "Bento Box Art Powered By Social Media"
Special Fork, "A Bento Lunch For the Picky Eater"
the kitchn, "Packing Kid-Friendly Lunches: 10 Alternatives to PB&J"
Cool Mom Eats, "9 Bento Box Ideas So Easty Anyone Can Do Them. Even You. (Even Me.)" Spoon University, "11 Drool-Worthy Pokémon-Inspired Bentos You'll Wish You Had"
Brit+Co, "Spice Up Your Lunch Routine With These 16 Bento Box Recipe Ideas"
The Art of Lunch, "Bento Heroines - Bento: The Art Of Lunch"
Become.com, "Bento Box Lunches For Your Little One"
The Friedman Sprout, "A New Twist on Lunch: A Bento Box for Better Health"
Words To Sweat By, "Monday Munchies: Sherimiya's Healthy Snack Bento Advice"
Pure Natural Diva, "Bento Butterfly - Entice Kids to Try New Veggies"
Wannabe TV Chef, "7 Questions with Sheri Chen"
ParentMap, "20 Lunch Box Ideas for Kids"
ParentMap, "10 Thanksgiving Bento Box Lunch Ideas for Kids"
ParentMap, "20 Halloween Lunch Ideas for Kids"
ParentMap, "20 Christmas-Themed Bento Box Lunch Ideas for Kids"
Foodista.com, "Bento Love: Bento Blog and Photo of the Week"
Sushi PRO, "Top Ten Bento Artists for 2011"
STAAR MASTER Grade 5 Student Practice Book, ECS Learning Systems, "Lunch Art"
Yummly, "Adorable Bento Boxes Make Fun Lunches for Kids!" Mashable.com, "35 Delightful Bento Boxes That Beat Your PB&J"
Greatist.com, "34 Healthy And Eye-catching Bento Box Lunch Ideas"
St. Patrick's Day Pot o' Gold Bento! Lunch with Santa and Rudolph - Holiday Ho Ho Hop! Petites cocottes... au parmentier de poulet ! Review: Smart Planet Home Glass Divided Bento Box!